Toad noticed that things were not going the way they should. For the sake of dignity - and to ward off future grief - she decided to protect the watershed by swallowing all of the water. She swallowed and swallowed - until she became as big and round as the world. With the help of 100 golden frogs, she releases just enough water so all the creatures and plants have enough. When anyone needs water, they let Mother Toad know, she signals one or mare golden frogs and they release some of her hoard as mist - but not too much - only just enough. That way everyone has what they need to live. MOTHER - A creative or environmental source: “Religion is the mother of the sciences.” LODE - A rich source or supply. 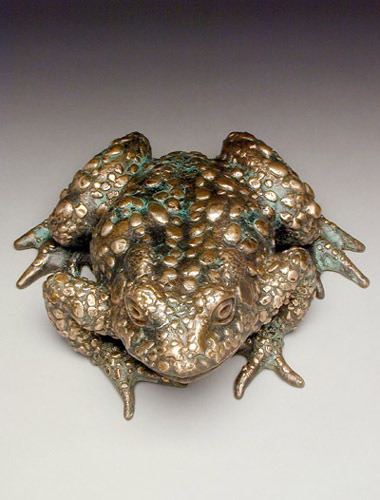 A massive, full bodied toad, approximately 36” in diameter and about 24" high is sculpted with reference to the Western Toad and cast into bronze. Its warts are actually in the form of 100 tiny golden frogs in several poses, each connected internally to a pressurized pump system which randomly shoots out a gentle mist from each frog, a benign series of events which is designed to delight and surprise the onlookers, especially children, who may be drawn to climb the mound-like Mother Lode.